Phoenix, AZ -- Somos Independents is an organization led by Mexican-American women leaders across this Nation. After we held our bilingual press conference answering the Phoenix Mayor’s call, we identified a new problem we anticipated with regard to the English-Only movement within the comments of the FOX 10 Channel News. That said, we stand by Lydia Hernandez’s recommendation to distribute bilingual flyers in the schools affected by the serial killer. As a school board member of Cartwright School District-- the 2nd largest school district in the State of Arizona, Hernandez suggested raising public safety and awareness in the schools that is up for a vote soon. We can all agree that we want the killer caught. And in order to do so, we must raise more awareness to Latino / Chicano community by placing in the hands of every single public school student a bilingual flyer they can take home to their parents. It is the cheapest way to raise awareness and increase public safety for our children—particularly in areas with a high Spanish speaking population. 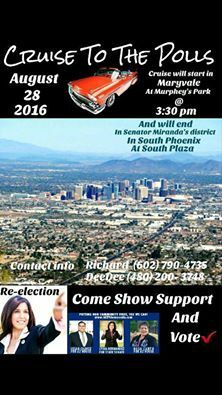 Tomorrow we will be partnering with the Arizona Cruiser’s Association to raise public safety and with Arizona State Senator Miranda. Catherine will give a speech to our community advocating public safety regarding the serial killer when she speaks to the entire lowrider / biker community audience in South Phoenix at South Plaza located at 6060 South Central Avenue, Phoenix, AZ. We will begin our Cruise To the Polls (Lowrider-style) at Murphy’s Park in Maryvale where cruise maps will be distributed, and we will end up at in South Phoenix at South Plaza (6060 South Central Avenue, Phoenix, AZ ) with festivities, entertainment, food, speakers and more. We expect a handsome turnout of lowriders to this event. My community is under attack and we are being hunted down like animals. This killer has not discriminated; he has shot adults as well as innocent children. He has shot Latinos and blacks. I find it extremely disheartening and am deeply saddened that our advocacy for public safety for our community brought out so much hatred for a language. I anticipated some backlash but I still have difficulty understanding the dislike for other cultures and languages. Please help us not lose focus. We are all humans and children of god and I urge us to not feed into the hate rhetoric. I urge folks to look inward and try to understand our perspective, urgency and need to protect our children and families. We should not tolerate one more death within our communities. As community members, it is our due diligence to ensure that we hold our public officials and police department accountable for the safety of our children, family and neighbors. These acts of violence must come to an end and it will take one brave community member to step up and provide the evidence needed to capture this terrorist. Thank you Phoenix Police Department, thank you block watches of Maryvale and surrounding areas, and thank you to every individual who has called in to provide tips against this individual. Police will soon hold this man in captivity and a bit of peace will be returned to the families that lost a loved one, knowing that he will no longer cause harm to our community.